The advanced technique is necessary for the replenishment of the air conditioner gas (gas charge). Especially, R410A of a new refrigerative is two kinds of mixed refrigerants, and it is necessary to note it variously because pressure is high. The kind of the gas used with a domestic air conditioner is as follows. It is hardly sold that the thing of mixed refrigerants of HFC-R410A (new refrigerative) uses HCFC-R22 in the main current recently. The basic gas charge method pulls out all gases (The gas is collected) and puts only a regulated amount while weighing the gas. It drives in air-conditioning. Doing the air-conditioning driving is also a difficult model, and has become the cause of a difficult thing during winter. 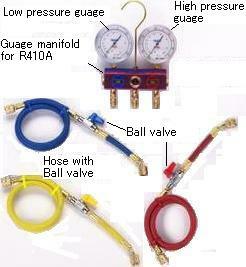 It puts after the measurement that can measure the gas cylinder to the unit of 100g or less and the hose with a yellow center of the gauge manifold like this photograph is connected with the gas cylinder while weighing it. Next, the hose that the low-tension side is blue (Red on a high-pressure side is not cared either) is connected with the service port of the pipe in fat one. The gas cylinder and the valve of the manifold are opened ahead of this a little and air in the hose is driven out. The gas canister gets cold and the gas doesn't enter during winter easily. This is one of the causes that the gas charge during winter is difficult. At that time, the gas cylinder is warmed by lukewarm water. Do not warm it directly by the fire. I think it is difficult if the operation is difficult, and the movement of the air conditioner is not understood though there is a method to do by heating driving, too. The way might be understood even if it doesn't say if it understands oppositely. The gas cylinder is made inverse without putting it with the gas and a recent new refrigerative gas is put with the liquid without fail. This is because the humidity mixing ratio changes when evaporating in the gas because of two kinds of mixed gases. When effective is a little bad, time and cost might be wasted to putting the whole quantity pulling out (Collect it) and again of all gases. Additional replenishment of the gas is done at this time. It is not necessary to worry so much strictly because there is a character not to be able to separate easily when the gas that the boiling point looks like is mixed once when the gas comes off little by little though a lot of gases of R32 in one with a low boiling point are sure to have come off. Moreover, even if the ratio of gases changes, the lower performance seems to be a little according to the manufacturer. Method of judging whether gas is regulated amount. The way that the manufacturer recommends is as follows. The low-pressure side pressure is compared with a regulated value. The current value of the power supply is compared with a regulated value. The temperatures fluctuate of the inhalation and the balloon is compared with a regulated value. Only when it is possible to obtain it, the characteristic table where the model of the manufacturer is detailed is limited by the outside temperature degree and the model to become it these regulated values because it is various. I have been doing by the following methods since the time of the gas of R22. The confirmation of the amount of the gas with the inverter air conditioner does the compressor by the maximum amount of the wind of the indoor unit it as much as possible in full power. It replenishes it with the gas little by little while seeing the adhering condition of the dew of the heat exchanger of the indoor unit (radiator) in the air-conditioning driving. When the gas is a little, it is usual that the vicinity of the pipe that came from the outdoor machine is cold well, and a previous getting cold is worse than it. When the gas becomes a regulated amount, the entire heat exchanger of the indoor unit comes to get cold uniformly. Then, the addition of the gas is stopped. There is a possibility of not going well, too, when the outside temperature changes though it seems to be able to charge with the gas well by this method. I think that you should do as much as possible at the midsummer. In the gas charge, stopping it in the place in which it is thought few a little is a miso. Any overcharge doesn't have the merit. The gas charge to the main body of the air conditioner is done by not the gas but the liquid phase. Even if the gas cylinder for recent R410 is not made inverse, the gas can be charged with the liquid. It is a miso because there is the one that breaks down in an old air conditioner, too, when the gas is charged with the liquid to charge with the gas slowly spending time as much as possible. Please it becomes a low temperature very much when the refrigerative becomes a gas from the liquid, and do, and protect gloves etc. so as not to hang in the human body. The gas in the hose goes out of the gas of R410A at a dash when the charge hose is removed because pressure is high. To prevent it, the ball valve of the charge hose is put up first.